Meditations on Mathematics | A compendium of puzzles, problems, math inquiries, and math commentary. A compendium of puzzles, problems, math inquiries, and math commentary. _________abcd + abc + bcd + cda + dab + ab + bc + cd + da + ac + bd + a + b + c + d = 2009. What is the value of a + b + c + d? This entry was posted in Puzzles and Problems and tagged algebra, UKMT Challenge on April 16, 2019 by Jim Stevenson. Since everyone by now who has any interest has gone directly to Catriona Shearer’s Twitter account for geometric puzzles, I was not going to include any more. But this one with its one-step solution is too fine to ignore and belongs with the “5 Problem” as one of the most elegant. This entry was posted in Puzzles and Problems and tagged Catriona Shearer, plane geometry on April 14, 2019 by Jim Stevenson. This is a challenging problem from Mathematical Quickies (1967). I came up with a motivated solution using some standard techniques from calculus. Mathematical Quickies had a solution that did not employ calculus, but one which I felt used unmotivated tricks. See the Infinite Product Problem. 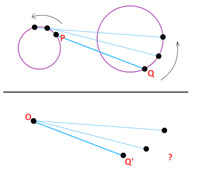 This entry was posted in Math Inquiries and tagged calculus, geometric series on April 13, 2019 by Jim Stevenson. I came across this problem in Alfred Posamentier’s book, but I remember I had seen it a couple of places before and had never thought to solve it. At first, it seems like magic. 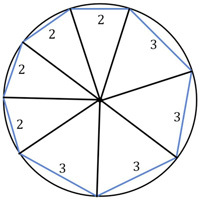 In any convex quadrilateral (non-intersecting sides) inscribe a second convex quadrilateral with its vertices on the midpoints of the sides of the first quadrilateral. Show that the inscribed quadrilateral must be a parallelogram. This entry was posted in Puzzles and Problems and tagged Alfred Posamentier, plane geometry, vectors on April 5, 2019 by Jim Stevenson. Here is a problem from the famous (infamous?) Putnam exam, presented by Presh Talwalkar. Needless to say, I did not solve it in 30 minutes—but at least I solved it (after making a blizzard of arithmetic and trigonometric errors). My solution is horribly pedestrian and fraught with numerous chances for arithmetic mistakes to derail it, which happened in spades. As I suspected, there was an elegant, “easy” solution (as demonstrated by Talwalkar)—once you thought of it! Again, this is like a Coffin Problem. See the Putnam Octagon Problem. 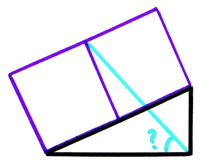 This entry was posted in Puzzles and Problems and tagged Coffin Problem, plane geometry, Presh Talwalkar, Putnam exam on April 4, 2019 by Jim Stevenson. This is one of H. E. Dudeney’s train puzzles. See Two Trains – Passing in the Night. This entry was posted in Puzzles and Problems and tagged Henry Dudeney, train puzzles on April 4, 2019 by Jim Stevenson. 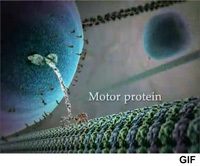 This entry was posted in Causality, Chance, and Connections and tagged motor proteins, Peter Hoffmann on April 1, 2019 by Jim Stevenson. James Tanton had another interesting puzzle on Twitter. This entry was posted in Puzzles and Problems and tagged complex numbers, James Tanton on March 31, 2019 by Jim Stevenson. This entry was posted in Other Voices and tagged gerrymandering, Jordan Ellenberg, politics, voting on March 30, 2019 by Jim Stevenson. One of the all-time examples of chance intervening in history is Christopher Columbus’s putative discovery of America. Moreover, the legend of this discovery is filled with erroneous information that was traditionally foisted upon unsuspecting elementary school children. One of the most egregious errors was the assertion that Columbus was trying to prove the earth was round and not flat. 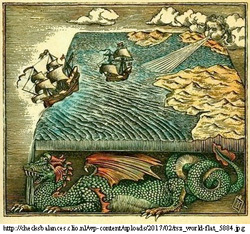 I had a picture book when I was young that showed sailors tumbling off the edge of a flat earth. I first came upon the demythologizing of the Columbus legend from reading Isaac Azimov’s anthologized 1962 column “The Shape of Things”. His tale is so well-written, that I want to include it in its entirety. I have augmented it with some more detailed footnotes and illustrations. See Columbus and the Irony of Chance. This entry was posted in Causality, Chance, and Connections and tagged Christopher Columbus, Isaac Azimov, Tony Lester, Washington Irving on March 29, 2019 by Jim Stevenson.